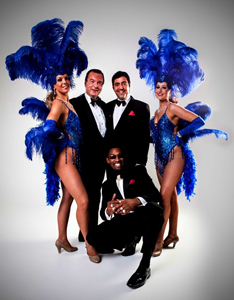 The hit tribute show ‘THE RAT PACK’ perfectly captures not only the wonderful music and comedy of the original legends, but also the remarkable personalities of the stars who truly ruled the entertainment world. These guys not only sing like their heroes, when on stage they physically resemble them, share their unique mannerisms and even talk like they are at the Sands taking part in the summit. THE RAT PACK AROUND THE WORLD! AS SEEN ON THE ROYAL COMMAND PERFORMANCE FOR HRH THE PRINCESS ROYAL. A performance for US President Bill Clinton at the Round House in London which was the biggest Rat Pack show in history and regular performances at – The Dorchester Hotel, The Cafe Royal, Gleneagles Golf Club, Wentworth Golf Club, Kensington Palace, Alexandra Palace, The Sporting Club of Monte Carlo, and the Limelight Theatre, Cologne. So sit back, relax and enjoy the show!